Could I respectfully remind you to keep all Postings short? Latterly we have all been slipping a bit. If you have a longish story to tell then Post a maximum of two paragraphs in the initial Post (in most cases one paragraph will suffice) then continue with your contribution in Comments, continuing from where you left off. 1. It keeps the Blog tidy and snappy. 2. The Blog loads faster. 3. It saves an awful lot of scrolling. Going through some of my photographs recently, I cam across one I had taken inside the Manchester YMCA building known as Montgomery House, taken in 1981. Occasionally I would visit Montgomery House when I was a full-time student at the University of Salford, or afterwards when I returned to the Manchester area to run in road races. This photograph was taken inside Montgomery House, which had been built by the YMCA with the encouragement of Field Marshall Montgomery after WW2. As well as sporting and recreational facilities, Montgomery House was built with rooms so that young people from all over the world could come to stay in a welcoming, friendly, environment. It was a fine legacy giving the opportunity for learning, sport and recreation. Many individuals and organisations contributed funds to the construction costs, and I remember many of the bedrooms had been funded by parents of young lads who had lost their lives during WW2 serving under 'Monty'. I photographed this Memorial Stone inside the main recreation room. 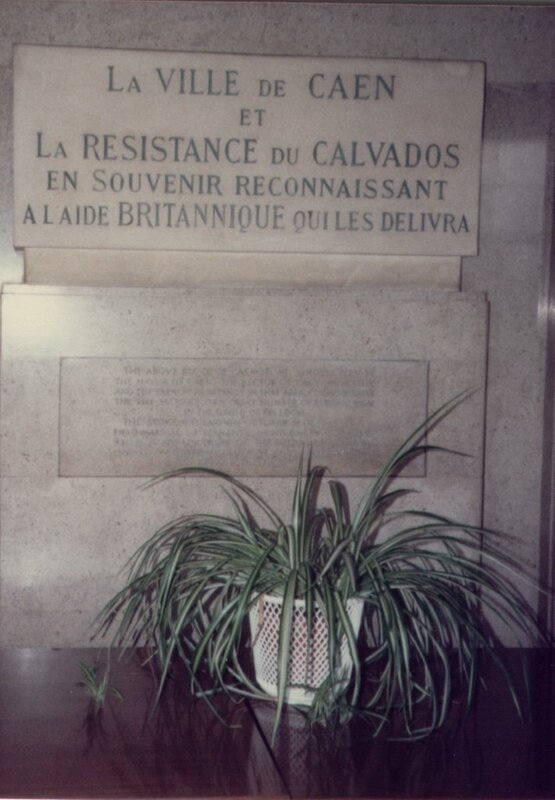 It was donated by the Municipality of Caen and the French Resistance in recognition of the British who had liberated them from Occupation only a few years earlier. Some years ago I heard that the YMCA had given up the sports grounds adjacent to Montgomery House and it was sold off for housing development. However, I also heard that Montgomery House had been taken over by one of the Manchester universities and still welcomed students from many nations who wished to study in the city. A news item at the end of August 2006 reported the dedication of a new Memorial to the thousands of airmen of RAF Bomber Command who lost their lives during the Second World War. Many former veterans of Bomber Command, relatives and friends attended the Service of Dedication at Lincoln Cathedral. Apparently, with a number of WW2 Bomber Command airfields being based in Lincolnshire, when airmen saw Lincoln Cathedral while returning to base meant they had survived another mission. . In May 2005, which by coincidence was the 60th anniversary of V.E.Day, I was staying with relatives who live in Lincolnshire. Among the places we visited in the interesting and historic city of Linclon were its Cathedral and its Castle. Among the historic items we saw was one of the remaining examples of the Magna Carta from the reign of King John. 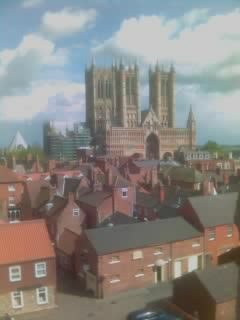 I took this photograph of Lincoln Cathedral from the ramparts of the Castle on Saturday 7 May 2005. Lincoln Cathedral was a welcome sight for the airmen of Bomber Command and must still bring back many memories to former veterans to whom it meant so much. The view of the Cathedral is still an impressive one. The internet is truly a wondrous affair and one of its major joys is when one stumbles across an item to do with research long since forgotten. Yesterday I was browsing the internet, came across a story on a website called ISTRIANET.ORG and it had a large piece on Globocnik. Who was Globocnik, I hear you ask?..... I hasten to explain. Globocnik was a particularly nasty piece of work, one time Gauleiter of Austria and when the war finished in Austria in May 1945 he was on the Allied list of ex SS who were to be detained on sight. One of the reasons for his notoriety was that he was known to have buried SS Gold to avoid its discovery. Different stories of Globocniks' capture and subsequent death have emerged. The one most commonly cited is that Globocnik committed suicide at about 11:30 a.m. the same day outside the small prison, 100 m west of the castle in Paternion. His body was photographed, together with his three comrades [pictured right], then said to be quickly buried and "confirmed" by poorly faked photographs of his body. A November 1996 report by Erwin H. Lerner describes the capture by the 4th Queen's Own Hussars of the 56th ("London") Division of Globocnik in Austria. The 4th Hussars were stationed in Italy as part of XIII Corps, commanded by Lt. Gen. Sir John Harding. They had no business in Austria, but were apparently working with the 78th Division and a Field Security Service unit based in Villach. Their target was not even Globocnik, but the Gauleiter of Carinthia, Dr. Friedrich Rainer. The fact that British units from Italy were involved in the capture of Globocnik may have led Michael Elkins and others to conclude that the men in British uniforms were avengers from the Jewish Brigade Group. Howard Blum has even written a whole book about it, but, to his credit he did not attribute Globocnik's death to these Jewish avengers. "Globocnik posing as an engineer in hiding from Partisans told a very plausible story, and had clearly thought out his cover very carefully. The whole party was marched off ... and taken to the HQ 4 Hussars in Paternion. "Globocnik was left by himself for some time. He had not up to this time been challenged with his true identity. He betrayed himself by half answering a summons shouted in his real name, and was thereupon told that we knew who he was. Still professing innocence he was marched away, but he had gone only some 150 yards when he collapsed and quietly died from hydrocyanic poisoning. It is almost certain that the glass ampoule was under his tongue from the time of his early morning, arrest as all prisoners were searched for poison, and one ampoule discovered on SS Sturmbannfuhrer Lerfh. "Rainer later confirmed that the dead man was in fact Globocnik. "At 1230 hours all the prisoners were handed over to Provost Office, 78 Division for disposal through 88 FSS." 0430 – The party (4th Hussars) arrived at the hut. 0510 – The door at the front was opened by Major Ramsey who had entered through a loft window. The door at the back was forced by Major Quarmby and Lt Hedley. Four men were found in the front of the house. Interrogation began at once and all men except the Gauleiter and SS Sturmbannfuhrer Lerch denied any knowledge of the SS. The women were allowed to remain in the hut, but arrangements are in hand (1430 hours) to arrest them. Dr Rainer, Lerch, three unidentified suspects and a fourth man who gave references in KLAGENFURT were brought down to the prison at PATERNION. 0715 – Schutz re-arrested on accusation of Kummerer. 1130 – The man suspected of being Glovocnik was trapped into acknowledging his name by a slight movement of his head when Major Ramsey shouted his name across the courtyard. He was ordered into arrest and poisoned himself with Prussic acid while walking the 150 yards between the Castle yard and the prison. Capt MM Leigh RAMC attempted to revive him but was unsuccessful. It was considered that he had had this poison concealed in his mouth from the moment in which the first alarm was raised at the hut as he consistently refused all form of refreshment. Three suspects on viewing the body confessed their identities as:-Sturmbannfuhrer der SS Michaelson,SS Sturmbannfuhrer Hoffle,Oberscharfuhrer Karl Hellesberger SS in TRIESTE. 1245 – all eight prisoners were removed by Capt Willett, leaving only Schutz in detention and under further investigation. 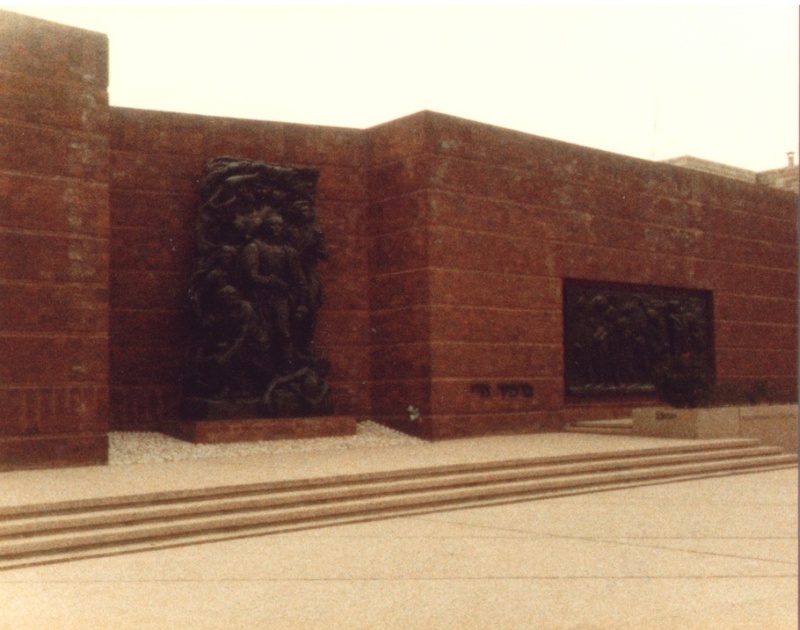 I took this photograph of the Warsaw Ghetto Monument at Yad Vashem, Jerusalem during a visit to the Holy Land some years ago. It is a place where the victims of the WW2 Holocaust are remembered. 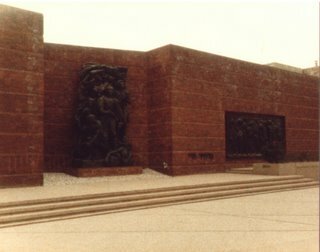 Yad Vashem has a good photographic and documentary record of a large number of the victims in addition to the exhibitions. Records of the victims, including some individual and family photographs of the victims are accessible online. Keeping the world on its toes. With the recent enquiries to the BBC “People’s War” Site helpers and contributors about dancing throughout the Twentieth Century, and in particular during the Second World War, I looked through some of the photographs, dance records, books and other information to find something of interest, and thought this photograph might fit the bill. Although this photograph actually dates from about 1955, and hence a few years after the war, it is one that illustrates so much. The original photograph is in the personal collection of Mrs Andé Tyrer. Andé used to be a professional Ballroom dancer when she was known as Andé Lyons. Andé has kindly allowed me to copy a number of her photographs and has given me her permission to write about them. It was very interesting to look through Andé’s collection of photographs, to learn of her dancing experiences and to hear about some of the wonderful people from the dancing world she has known. .
For the BBC “People’s War” project, I wrote about some of the things that Andé told me about the years she was a professional Ballroom Dancer during and after the Second World War. Consequently, I posted three stories to the “People’s War” website about dancing during WW2 (References A4165166, A8035382, A8054002). 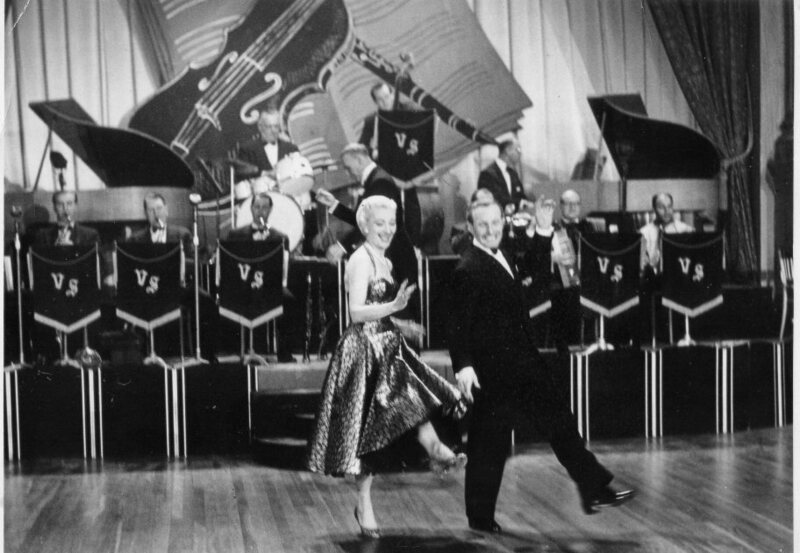 Andé began dancing professionally with Walter Laird during the Second World War. 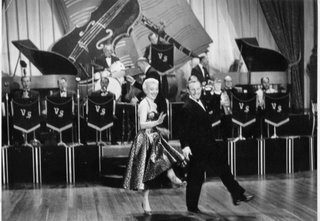 They used to give dance demonstrations and worked with many of the top dance bands of the era, including the Victor Silvester Dance Orchestra. A recent news item (August 2006) reported that former WW2 veteran, 83-year old Ray 'Flash' Gordon, had visited the Bovington Tank Museum, Dorset, and had been for a spin in a Churchill tank for the first time in 62 years. According to the report, the last time Ray had been inside a Churchill tank before this was 10 July 1944. This had been during an assault on 'Hill 112' to the South-west of Caen during the Battle of Normandy. Ray's tank was hit by a shell from a German Tiger tank, causing an explosion. Ray was the only one of the crew able to escape the blaze, but in doing so suffered terrible disfiguring third-degree burns. During his visit to Bovington, Ray had the company of one of the comrades he served with in 9 Royal Tank Regiment, Cyril 'Smudge' Smith. In the news report, it showed both these former troopers taking a ride in a Churchill tank. In Ray's case at least, it was the first time he had been inside one since the war. While Ray experienced the loss of his closest comrades on 10 July 1944 and suffered both physically and mentally, it did lead to a significantly happier event in his life a little later on. Ray went on to meet his wife Joan who was a physiotherapist at the hospital where he was being treated for his injuries. According to a spokesman for the Tank Museum, Nick Wyness, the intention of the Museum is not just to preserve the vehicles, but to honour the men who fought in them. It seems to me the Tank Museum is doing a fine job in both respects. They also know about the 'Canal Defence Light' as well! While making a comment about a recent posting about Second World War Tanks I referred to the night-time tank manoeuvres that took place on the Lowther Family Estate of the Earl of Lonsdale in the latter part of the war. Lowther Estate is situated a few miles to the south of Penrith, Cumbria. I have since made a few enquiries about the tests. What follows is a brief summary. The intended strategy was for tanks to advance in formation and blind the enemy, at least temporarily. As a result, any supporting advance by the infantry would be a cakewalk and much ground would be gained. Among the Generals and VIPs who visited Lowther to see the manoeuvres were Winston Churchill and General Eisenhower, who apparently were suitably impressed. One defect of the weapon was that the effects of the weapon were mitigated if the enemy wore Ultra-violet glasses. Apparently, it was also felt by some that a weapon that attempted to blind the enemy was 'not quite the done thing'. Also, by the time the weapon was ready for use towards the end of the war, there was less need for a tanks to have this kind of night-time fighting capacity. Hopefully this makes explanation makes at least some sense to those contributors to the 'Second World War' Blog with a better understanding of tanks. Nowadays, some people in Cumbria refer to these secret tests of tanks using beams of light as using 'laser beams', a term which only came into use in the post-war years. There is very little information about the night-time tank testing in the Cumbria County Archives. So I can provide few additional details than what has been written here. No doubt there are enthusiasts of tanks who know all about Matilda tanks and can speculate much better about the possible success of this kind of strategy. Has any one got memories pleasant or otherwise of the good old Garrison Theatre. Every Garrison had one, they were used for Dancing, Shows with either travelling players, or amateur shows put on by the men of the garrison. Often as places for the unit to be lectured or briefed on some move or manoeuvre. My memories are mainly the once a week dance at most of them but I also saw and helped one very good amateur show and a classical pianist who played a concert for us. I reached your excellent blog through reading Frank Mee's memories on the BBC site - The Peoples' War. I am just starting research on a new BBC series called Britain on the Move. This is an archive-film based series on a century of British people dancing. I would very much like to ask if any of your contributors would like to get in touch with their memories of dancing during the Second World War. Would this be possible? Let me know if you have anything to contribute. Have just finished reading an account and analysis of the “Totalize Battle” In Normandy by Ken Tout who has written a few books from his experience as a tank crew member of the Northampton Yeomanry which was in 33rd Armoured Brigade along with 144th and 148th R.A.C. It is a fair account although somewhat repetitious, of the combined Tank assault by British – Canadian and Polish Armoured brigades to close the Falaise gap, and is an excellent account of some of the innovations made – again without too much rehearsal of the changes to established Tank warfare. He makes the point – already well known – but ignored seemingly, from battles in Africa regarding the superiority of the Panzers to our Tanks – also the constant production of Shermans by the all powerful American production lines, knowing that they were inferior, whereas the British did produce the Churchill – Cromwell and finally Comet with a reasonable gun in the 17 pounder and finally for the Artillery – the late 3.7 anti tank gun. Which is a fair bellyache as it was the Valentine with their two pounders of the 6th Armoured Div and the mix of two and six pounders of the 21st and 25th tank bdes which turned the tide along with the heroics of the 25 pounder gunners. It was just before the final battle from Medjez that all British Tanks were issued with the 6 pounder. The American Sherman maintained their 75mm gun throughout and it was not until the British 17 pounder became more numerous that they were fitted as “Fireflys”. The "air supremacy of the Daf was only after boith Tedder and Coningham went ove to Algiers and Monty was able to get Broadhurst to institute the "Cab Rank" for th El Hamma battle.